Ecoideas Rice Bran Oil is heart and weight healthy, with 0 cholesterol! It has 6 times more omega 6 and 47 times more antioxidants than olive oil. Just 1 tbsp contains 110% of your daily vitamin E! It is also high in Gamma Oryzanol, an antioxidant only found in Rice Bran Oil. Delicious on salads and a healthy choice for high heat cooking (high smoke point of 495°F). Ingredients: 100% Pure Rice Bran Oil. No additives or preservatives, made from GMO-free basmati rice with no pesticides or herbicides. This is my favourite oil. It has a very neutral flavour and is great for dressings and frying too because of its extremely high smoke point. Also, the bottle is huge! It will last me a year! Excellent product. I could not find this product anywhere and needed it when I started the eczema diet. It is great in salad dressings or if you use it for frying. This will be a staple in my pantry. Excellent product! First learned about it in Sausalito at an upscale restaurant where fries were cooked in this oil. It is excellent for frying as it has a very high heat point, neutral taste and really adds a crispy texture. Added health benefits as well with Omega's. Odd have never seen it used on any cooking shows. 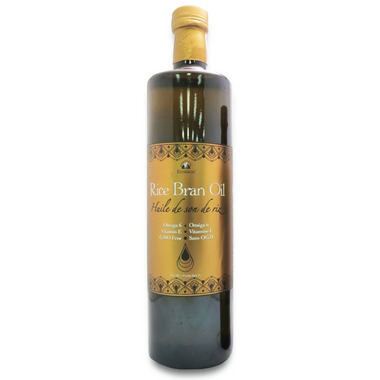 This oil is so superior to any other cooking oils. Learned of this oil when I began a special eczema diet. Don't think I'll ever use anything else. No strange taste added to foods. Love it! First used this in New Zealand. Excellent product. Wish it came in bigger containers as I don't want to use anything else ! Love this oil for cooking, no strange after taste! Also great for baby's cradle cap.